It is easy to forget to take care of your feet in the wintertime, when temperatures are freezing and multiple layers of clothing are applied just to walk outside. However, your feet need to be maintained all year round to maintain good overall health and comfort. Learn more about winter foot care tips that keep your feet looking great while protecting them from harsh winter climates. 1. 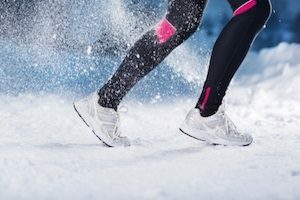 Wear the Right Clothing: Those that remain active in outdoor activities such as running in chilly weather should remember to wear light-weight clothing that wicks moisture away from the body. This includes moisture-wicking socks that help keep perspiration away from feet during physical activities. 2. Keep Feet Dry: Boots are a necessity in winter temperatures and precipitation. However, the boots and socks worn to keep the feet warm and protected can cause the feet to sweat, which can lead to bacterial infections. Keep your feet dry with foot powder you apply to the inside of the boot to absorb moisture. You can also pamper your feet with extra foot baths this winter. 3. Use the Right Gear: Never use any kind of footwear but ski boots when snowboarding or skiing. Ski boots are especially designed to protect the foot and ankle during this activity by keeping the feet in position, even while the skier is moving. Wearing the wrong footwear while skiing can lead to broken ankles or other injuries. 4. Wear the Right Shoes for the Season: Leave the flipflops for summer. It may be tempting to slip on a pair of summer shoes when standing outside on a winter afternoon but this can lead to frostbite or other weather-related injuries. Keep your feet protected and warm on a winter day with season-appropriate shoes. 5. Get the Right Size: Children and adults require the proper fitting footwear in any season but especially when roads or concrete can hold slippery ice. Shoes that are too big or too small can leave sores, blisters, or chaffing on the feet and cause the person to fall. The proper fit helps maintain balance while protecting the feet. Foot care is important for your overall wellbeing. After reading these winter foot care tips, if you discover that you have an issue with your feet and need a good podiatrist, call to schedule an appointment with Michigan Podiatry. This full service clinic provides a range of services including routine exams and emergency appointments.